Norfolk's Sheringham Golf Club has called on a duo of seeders from Charterhouse Turf Machinery to help their aim of achieving 'continuous development'. With advice from course consultant Gordon Irvine, the club has undergone a transformation in recent years, one of the biggest changes is the push towards increasing Fescue cultivars into the greens and fairways. Head Greenkeeper, David Childs, has been at Sheringham for 23 years and is supported by a team of 6 greenkeepers. "Our sward conversion programme has been in place for three full seasons and was kickstarted alongside investment in new machinery" he explains. "We went for the Redexim Verti-Seed 804 for the greens as we were impressed with the gear system which meant we could easily and accurately control the amount of seed the machine was putting out. For fairways, we chose the larger Redexim Overseeder 1275." The current regime involves a double pass on the greens, in August and October. 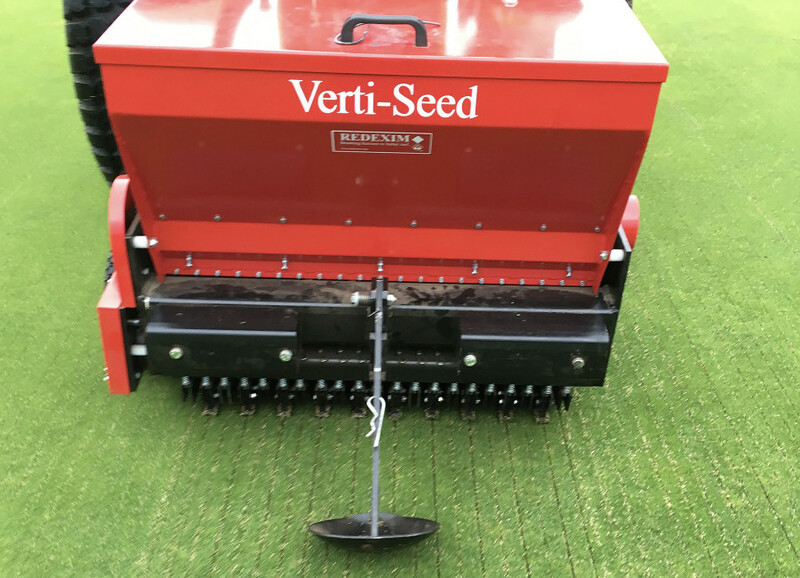 "The Verti-Seed is a really simple machine to set-up and leaves a nice smooth finish, which is key for the work on the greens. Because the seed is delivered straight down into the soil profile, we've been achieving fantastic uptake, even in the drier conditions. Following the work, the surfaces look great again in as little as a week which, as September is a very busy time for us, is important." Two passes are also conducted with the Overseeder on the fairways, however, this tends to be later in the calendar, to capitalise on the increased moisture content therefore helping to maximise uptake. "We estimate it's going to be another three years or so on the current programme before we will then reassess. Increasing the fescue content will ultimately reduce our reliance on feeds and water, which will be positive for us. The Redexim machines are vital in achieving that outcome and to date, they've been producing the results we've been looking and hoping for."